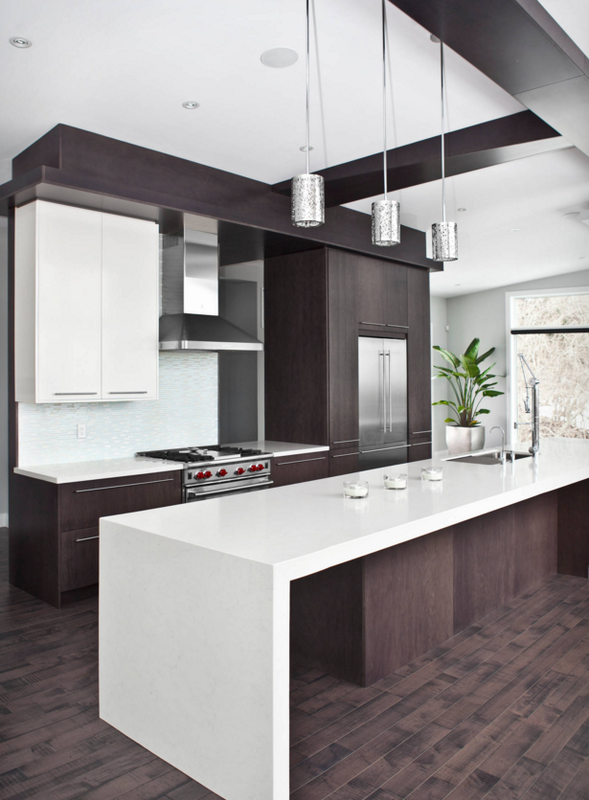 The style of the today’s modern kitchen is synonymous with minimalist design. Minimalism is the art of living with only the necessities. 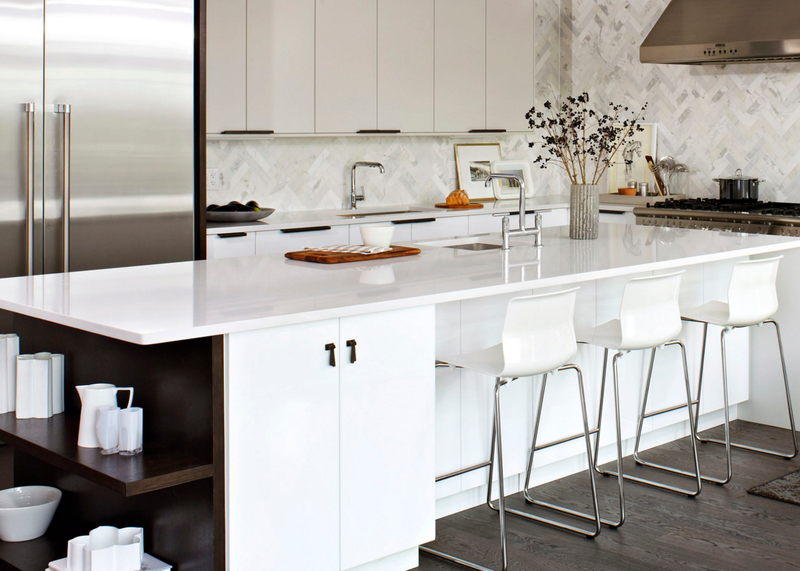 A modern kitchen is simply a pared-down version of the traditional kitchen. Clutter is non-existent in a modern kitchen and small appliances are hidden from view, but easy to access. Color schemes used in modern kitchen design is neutral, but has a wide range, due to cabinet and countertop options. Quartz countertops are widely used and more popular than their granite counterparts in modern kitchen design. Cabinets have flat panel fronts and streamlined hardware, with some cabinets lacking hardware all together. Backsplashes are simple, linear, and usually match the color of the countertop or surrounding wall surfaces. High impact is a calling card of modern kitchen design. The espresso stained cabinets and floor give great contrast to the bright white countertop, backsplash and single upper cabinet unit. 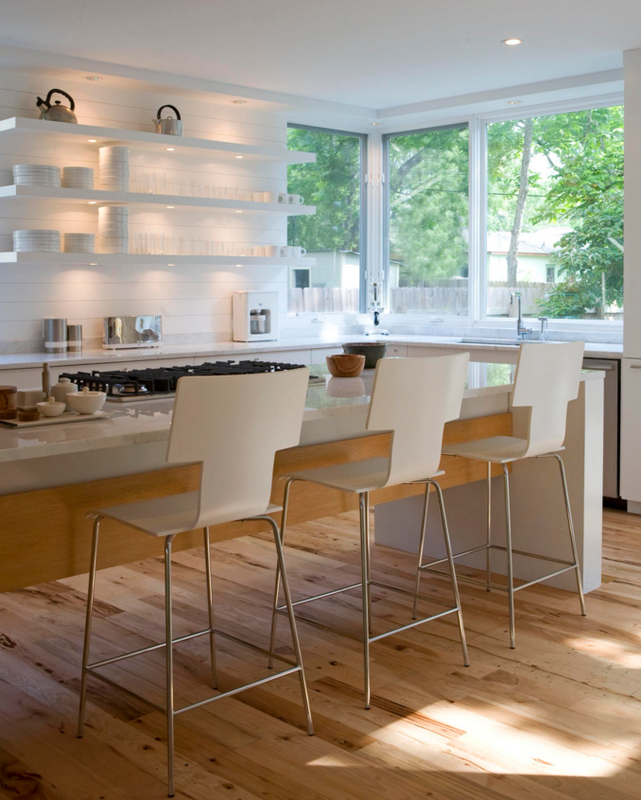 Modern stainless pendant lights pair nicely with the stainless appliances. Yes, IKEA sells kitchens too! These ready-to-assemble kitchen cabinet configurations are endless from door styles to inserts to hardware. IKEA, the swedish retailer, knows how to put together an amazing modern kitchen at an even more amazing price. IKEA makes shopping for your new kitchen easy with their Find Your Dream Kitchen page on their website. They will even send a professional kitchen planner to your home to measure and design the layout if this project is above your paygrade. Just because all of your small appliances are put away doesn’t mean you have to drag them out each time you want to toast a bagel or make a pot of coffee. 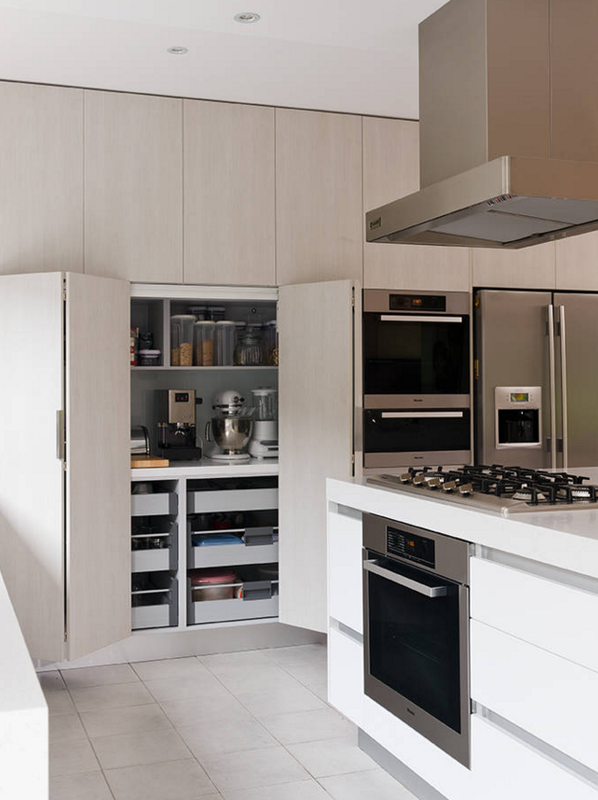 Modern kitchen designers have created brilliant configurations that allow you to access your appliances where they are stored, then hide them away again after use. One minor negative surrounding modern kitchen design is the lack of warmth. Some feel this design is cold, stark, and lacking in natural elements. The cure for this issue is to add something organic. 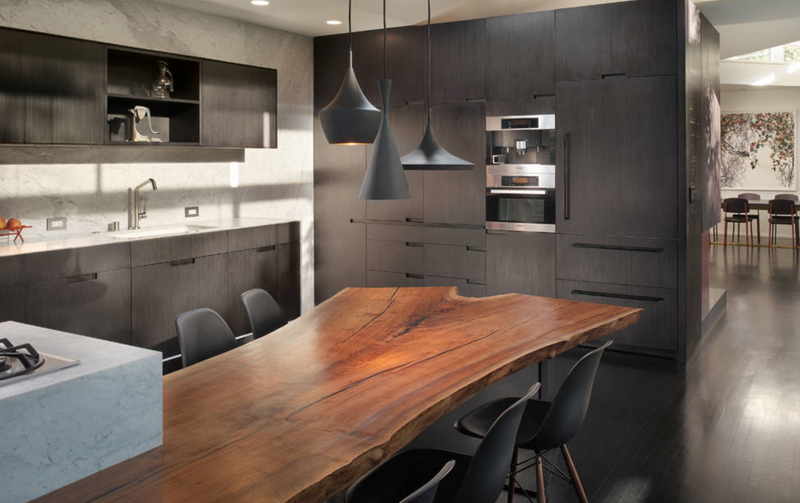 These live edge, solid wood slabs shout organic in a big way and offers a comfortable place to gather with family and friends while preparing meals. Open shelving is a signature look in the modern kitchen. This design gives an airy feel to any kitchen space, no matter the size. The backsplash continues behind the shelves and reach to the ceiling; the dishware will need to have that minimalist look and feel to complete this look.